First prepare a drill which is thicker at the point than usual, and oval in form, then harden it as follows: heat to a low cherry red heat and cool in the following hardening compound: two quarts soft water, one-half ounce sal-ammoniac, salt, three ounces. Don't draw the temper, for if you have the right heat you will get the right temper. Now drill and use water, not oil. Feed carefully but so the drill will cut right along. If you have no chance to get the compound, harden in water but draw no temper, let it be as hard as it will. If the iron is too hard to be drilled and you can heat the same do so, heat to a low red heat and place a piece of brimstone just where the hole is to be; this will soften the iron through, so the hole can be drilled. Let it cool slowly. 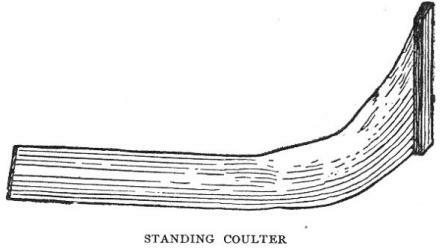 Standing coulters are made of different materials and of different shapes. Take a piece of iron 2 � x 1/2, twenty-eight inches long. Cut off the end after you have thinned it out about 5 inches from the end, cut diagonally Now weld the cut-off piece to the main shank. The cut-off piece to be laid on the outside and welded, bend the iron as soon as it is welded so that it has the shape of the coulter, draw out a good point and sharpen the iron just the same as if it was a finished coulter. This done, cut off a piece of steel, an old plow lay that is not too much worn will do, cut the shape of the coulter you have now in the iron, and let the steel be half an inch wider than the iron, but on the point let it be as long as it will, because the point ought to be quite long, say about nine inches. Next draw the steel out thin on the upper end, heat the iron red hot, place it on the anvil outside up, put a pinch of borax on it at the heel, then a pinch of steel borings, place the steel on top of this and keep in position with a pair of tongs; now hold it on the fire heel down, and heat slow. When it is hot let the helper strike a pressing blow or two on it and it will stick until you have taken the next weld. Put borings and borax between steel and iron for each weld. When finished, the angle should be that of the square; that is, when you place the coulter in the square the shank should follow one end of the square and the foot of the coulter the other. The edge of the outside side should follow the square from the point up. When it does it looks like a hummock in the coulter but it is not. Old breakers will be particular about this as it will cut a clean furrow if it is made in this way and it will work easier. If the edge stands under the square the coulter will wedge the plow out of land and make a poor furrow. Next finish the chisel point, soft or hard steel as you please; weld it to the coulter on the inside, that is, the side next to the furrow. Last punch or drill the hole in the heel. The coulter should not be hardened except a little on and along the point. There is no need of a double chisel point, such a point will be too clumsy and run heavy. I have received a premium on a coulter made in this shape.